Kelsey Jordan is a 2014 graduate of the Louisville School of Massage and is a newly Licensed Massage Therapist for the state of Kentucky. Originally from Southern Indiana, Kelsey grew up as a musician and aspired to become a performing artist. After a change of heart while in college, Kelsey decided to pursue massage therapy as a way to heal herself and those around her. Kelsey has always had a passion to give back to the community, and she is fully committed to customizing massage for every client’s needs. Her sessions are focused on providing relaxation and healing. Being a new graduate, Kelsey has a lot of room to grow and learn in the field of massage therapy. She is strongly interested in hot stone therapy, trigger point therapy, prenatal massage, and sports massage. 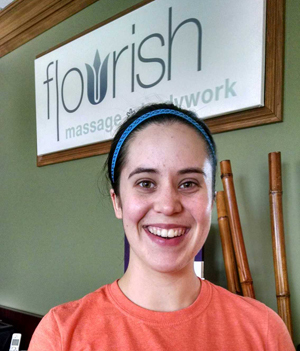 She will be continuing her education to better serve her clients and is so very excited to join the team at Flourish Massage & Bodywork! Away from massage, Kelsey is newly married and moved from Southern Indiana to Cincinnati, Ohio at the beginning of 2015. She and her husband have two young, and very excitable Jack Russell Terriers at home.